You get to meet a few people in this game. We've have had the pleasure of raising a glass with quite a few "colleagues" from this football, travelling and writing business but few are as passionate and committed to the cause than Michael "Stoffers" Stoffl. A huge 1860 Munich fan both in terms of his size (Stoffers is the tallest man in Germany at 8 foot tall*), and his support for his side we have had the pleasure to travel to various places across Europe to watch games and thoroughly enjoy his company both on the terraces as well as on the dance floors of Havant. So when Stuart Fuller and I recently bumped into him in the transit lounge in Munich we thought we would sum up the world of Stoffers in a thousand words or so. If ever someone summed up the ultimate travelling football fan, it would be you wouldn't it? When was your first trip and to where? That’s a bit over the top. I’d rather leave that title to someone else. Anyway, on my first away trip I was only 10 years old. My dad and three of his mates went to the 1982 German Cup Final in Frankfurt and tagged me along. A cracking game. Nürnberg were 2-0 up at half-time but Bayern turned the match around and won 4-2. I remember the ridiculously packed terraces and some crowd trouble after the match. And a very long ride home. I loved it but still chose 1860 Munich to become my team. Stoffers the man, the myth the legend. Tell us something that we don't know about you that may shock and surprise your fans? I’m a big fan of Afro-Caribbean music – with a focus on 1970’s roots reggae, northern soul, ska, soca, samba, salsa – you name it. Only a few years ago I started to explore the African music scene. So many different styles; there’s still a lot to discover. There is a general impression that you live in airports based on the amount of travelling you do. How many games did you see last season? Around 75. I don’t tend to count them but I do keep my match tickets. I managed games in over a dozen countries including a trip to the Asian Cup where I met up with the legendary Dagenham Dan and Brian of the Dagenham Diary fame. 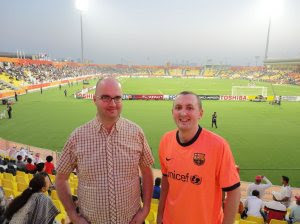 Qatar Heroes: The Real Stoffers and Dagenham Dan at the AFC Asian Cup. You must have covered a game in most countries in the developed world by now. How do you determine where to go next? A combination of factors come into play. Either I’m picking a particular match I’d like to watch and build something around it. Or I find a cheap fare to some destination and then check out what would be feasible in the area. Recommendations by others always play a big role, too. What is the ultimate aim? What game or place would you consider to be the pinnacle of your footballing travels? Always dreamt of a footie break for a week or two in Buenos Aires, and will probably make this come true early next year. But my ultimate dream would be to go on an extended overland tour through Africa, Asia, and/or South America, taking in as many countries and games along the way as possible. I’ll definetely make this come true before I’m getting too old for it. Your life on the road would make a great film. But who would play Stoffers? Hmm, maybe John Candy, but since he’s dead I’ll pick John Cleese. Not everywhere in the world is as open and accommodating as some of the places we have visited like Spakenburg or Budapest. So have you ever been in a situation when you have thought - "this is my last European football trip "? No, never. I’ve been doing well so far to avoid dodgy situations. And I’m never getting tired of combining travel, football and having a good time. What one item could you not do without on your travels? Apart from the obvious (money, passport, my glasses), I’m always carrying a can of Swedish snus to keep me relaxed. Snus Party: Stoffers relaxes after a good pinch of Swedish snus. You must have been to some cracking games though. What has been the best atmosphere you have experienced? I don’t have an obvious favourite: Flamengo v Fluminense at the Maracana. In the away end at Ibrox for an Old Firm derby. Ghana beating Nigeria after being 1-0 down and Mensah sent off (quarter-final of the 2008 African Nations Cup). And 1860 Munich promoted to the Bundesliga after 12 years on the last day of the 93/94 season at SV Meppen (10,000 away fans in a 15,000 capacity ground 800km away from home). And there are few better experiences than an Istanbul derby. I have been lucky enough to be at Besiktas v Galatasaray. For every great ground there is always one at the other end of the scale. So time for the truth. What is the worst place you have seen a game? FK Rad Beograd. Security forces collected my phone and my door keys to be picked up after the match. I complied but picked everything up and left at half-time as I was really pissed off. Otherwise, Belgrade is a top destination for football. Just don’t go to FK Rad. 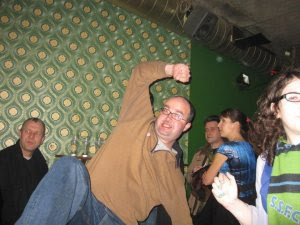 Apart from your talents as a bingo caller as we all remember from THAT coach trip in Slovakia, we've heard you are a bit of a mover on the dance floor, who is your inspiration? Haha. That’s got to be Leroy ‘Horsemouth‘ Wallace in the classic 1978 Jamaican movie called ‘Rockers‘. So the new season is upon us and I bet you cannot wait to get your teeth into a game or two. So what's up next for Stoffers? Start of the 2. Bundesliga next weekend. Braunschweig away for me, then I’d like to get most out of the domestic matches in Germany during some weekend trips during August. We have known and loved Stoffers for many years. His enthusiasm for the game is hard to beat and his is one of the most helpful people you can ever want to deal with. He can be found on Twitter here and his website is 1860er.de. 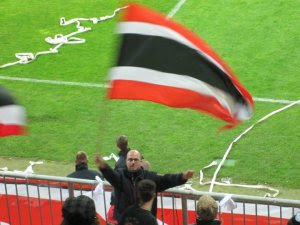 Life's A Flag: Stoffers conducts the Spartak Trnava ultras orchestra. Stoffers is the author of one of the most popular ever articles on EFW. 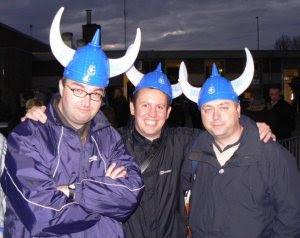 Lead photo: Stoffers, Danny and Stuart Fuller at the Spakenburg Derby. * He isn't really 8 foot tall or the tallest man in Germany but he is bloody big. We love you Stoffers, we do! OOOoooh Stoffers we love you!!!!! Our very own HuddoHudson is also a big fan of Swedish Snus. If Stoffers is eight feet tall, that bloke I saw at Essen must have been twelve feet. Great interview - great Möter!